This blog has been a bit quiet recently as I was busy applying for a job (I didn't get it) and a PhD (my proposal needs more work), so the painting brush has been resting for a while. However, after a few weeks of patiently gathering the correct figures together I have been able to finally finish off the German infantry portion of the Stalingrad lists I have been working with. OK, I am still missing two artillery observers, which I only noticed when going through the lists again, but they won't take long to paint and add to the group. This Sunday I painted the 14th Panzer Division's engineer battalion in one sitting, this unit has three companies each of nine men (and a flamethrower each...) and a HQ of a CO plus three men. The figures are a mix of Peter Pig, Command Decision and some of the remaining Plastic Soldier Company figures that I have left over. I also must mention that some of these figures were given to me by Mr Neil McGurk, in exchange for some odd bits that I had.They helped fill out the unit nicely. 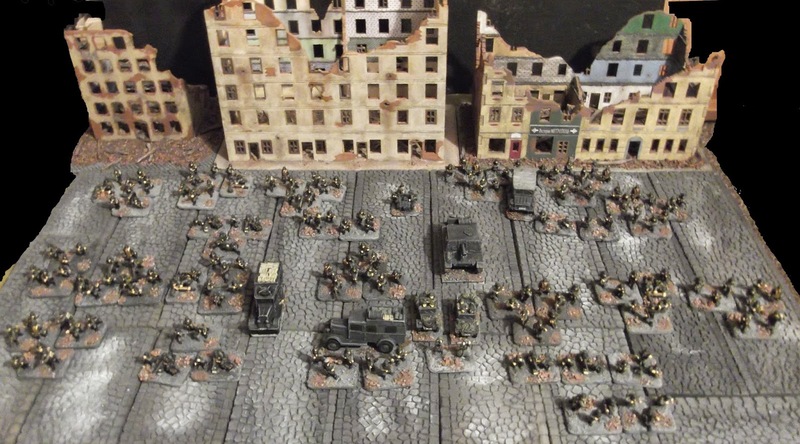 As I said, these finish off the German infantry for Stalingrad and here they are in all their tiny glory (with the few vehicles that I have). This is the stage that I am at with the project; the majority of vehicles are still missing, as are the supporting guns, so we're not out of the woods yet! Every painting session brings me closer to the end of this vast project, but as I have mentioned before I am saving for a holiday so the tanks and guns will have to wait until I've visited the Golden Gate Bridge and Yosemite National Park. I am also selling the rubble you can see on the bases of the figures, HERE on EBay, it's pre-painted and comes in three colours of black/grey, dark brown and brick red. Perfect for any scale from 6mm to 54mm and can be used for urban bases and other modelling projects! Thanks Phil, I have a few more buildings to add, so expect more in future! looking good Alex as always may I add. Thanks Russ, that's a great compliment coming from you! Can you talk a bit about those buildings and what make they are? They make a spending backdrop for your troops. Best with future job applications. What discipline are you hoping to do the PhD in? I was going to study how the First World War is presented to the public through archaeology, museums and television documentaries and to see how much revisionist history had crept into these mediums of engagement.